Air Canada will no longer reward travellers with Aeroplan points after June 2020. Instead, the airline will focus on developing their own loyalty program. (A representative has confirmed that Aeroplan collectors can still redeem their points after 2020, they just can’t get new ones when purchasing flights.) Many of Aeroplan’s 5 million cardholders may be ticked off at this, but some analysts say this is actually good news: there could be a surge in attractive incentives come 2020, when all those loyal Aeroplan folks are suddenly considered free agents. Air Canada’s new program will compete with Aeroplan fighting to keep its customers, and surely Air Miles will want to lure stragglers—particularly now that they’re out of those dark days of lawsuits over expiring points. Hurray, capitalism! The United States might ban laptops from carry-on luggage on all flights from Europe. What began as a ban on all electronics larger than a cellphone that affected flights from 10 Muslim-majority cities could evolve into a ban on all laptops coming from Europe, the New York Times reported on Wednesday. According to an anonymous airline insider, the problem was that potential terrorists could still smuggle bombs hidden in laptops aboard airplanes that connect from the Middle East through Europe to reach the States—though the Times also interviewed an intelligence official who claimed it was to prevent the US from radicalized European citizens. Officials have repeatedly clarified that these bans are not a result of any specific threat. What countries depend the most on tourism dollars? A beautifully designed map from How Much, a cost-information website, has been circulating the web this week. 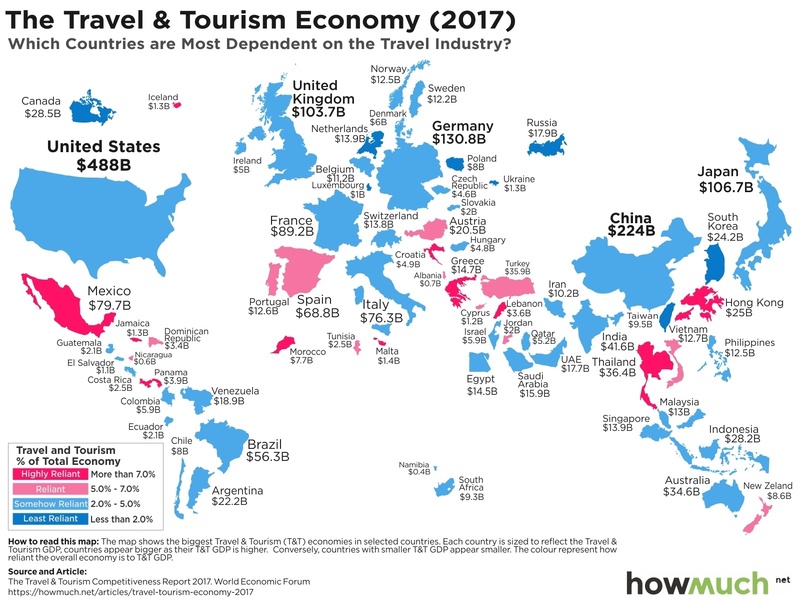 What’s fascinating is comparing the absolute numbers with relative percentages—just look at Hong Kong and South Korea, which both earn roughly $25 billion annually from tourism, but whose economies rely on those numbers in radically different ways. While the map is far from globally comprehensive (Peru? The Baltics? The other 49 countries in Africa? ), it’s still fun to browse. You can read the full report and breakdown here.